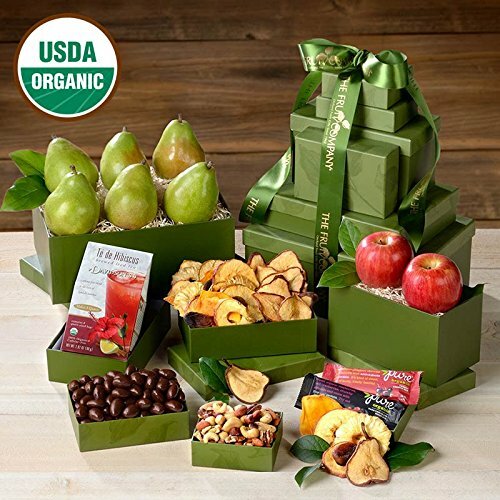 Whoever receives this elegant Organic gift tower will delight in opening each box. It's filled with delicious organic fruit (apples and pears) plus dried fruit, sweet cherry cashew bars, organic dark chocolate almonds, and a hearty organic mixed nuts. It's truly like getting several gifts all at once. 1 Organic Dried Fruit - 4 oz. 1 Organic Mixed Nuts 1 Organic Dried Pear Slices - 4 oz. 1 Organic Dark Chocolate Almonds - 4 oz. 1 Organic Cherry Cashew Bar - 1.7 oz. 1 Organic Dark Chocolate Berry Bar - 1.7 oz. 1 Organic Te de Hibiscus Iced Tea - 2.82 oz. 2 Organic Apple(s) 6 Organic Pear(s) For optimal freshness and quality, or due to seasonality, we reserve the right to substitute certain ingredients of equal or higher value.